I can remember a turning point of when we were all very sick and when we seemed to take a turn toward healing. My son was too sick to go to school and I was spending every waking moment researching how to get him well. I was pretty sick too… but all my focus was on getting him well. 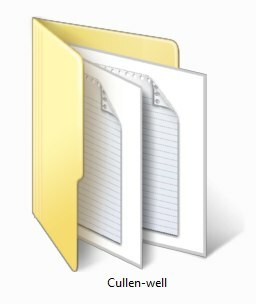 The folder that I was putting my research in I had named: Cullen-sick. I read the book, “The Science of Being Well” and decided to rename the folder: Cullen-well. I started to find answers very quickly… and everything seemed to be working in our favor. For months before that, I had been doing much the same research… and my son was only getting sicker. Your getting well does not depend upon the adoption of some system, or the finding of some remedy; people with your identical ailments have been healed by all systems and all remedies. Even though it only says “work” we eventually found out that we were living in a “sick building” and that we lived under poisonous conditions. In this case, you cannot think yourself well if you are being poisoned. You must remove the source of the poison or remove yourself from the poison. I was still researching like a mad-woman… but instead of focusing on what was keeping Cullen sick, I began to focus on what was going to get him well. A slight shift in thinking… that made a big difference. I don’t mean to say that this book got either of us well… that would mean that our sicknesses were all in our heads and they certainly were not. We tested positive for bacterial infections, spirochetes, viruses, parasites, and fungal infections that were making us sick. I highly suggest you read this book! or many things that help you to feel better. Best of all… the book is free! Get the Science of Being Well for free! This entry was posted in Mind and tagged being well, perfectly healthy on December 30, 2012 by Heather Plude. Thank you for posting this! I am off to purchase the book shortly!